Updated: Nov. 4, 2016 at 8:23 p.m.
Pamela Jeffries, the dean of the School of Nursing, has received the National League for Nursing Mary Adelaide Nutting Award for Outstanding Leadership in Nursing Education, according to a University release. She was nominated for this award by her colleagues in the nursing school, according to the release. The criteria for the award include leading scholarly activities, encouraging creative interactions with students from different backgrounds and mentoring and serving as a role model for junior faculty, according to NLN’s website. “Receiving this coveted, major NLN leadership award is a highlight of my career, and I especially want to thank my GWSON nursing faculty for nominating me,” Jeffries said in the release. 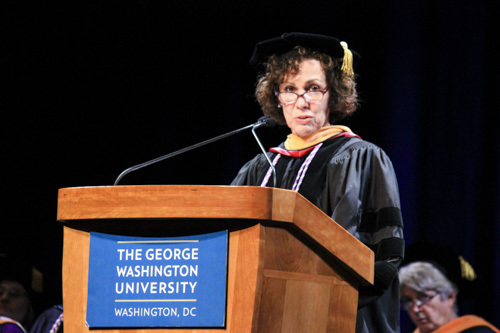 Jeffries became dean of the nursing school in 2015, after serving as the vice provost for digital initiatives at Johns Hopkins University. Under her direction, the school has had an increased focus on research and has been rapidly expanding, hiring for 11 new positions at the end of the last academic year. Jeffries also led the NLN’s early research studies on the use of simulation in nursing education and last year the NLN Jeffries Simulation Framework became the NLN Jeffries Simulation Theory, “a guide to implementing lifelike instruction and developing skills through nursing education,” according to the release. Beverly Malone, the NLN chief executive officer, said that Jeffries is known for developing creative approaches to online teaching and experiential learning, according to the release. “I am proud that the NLN will be forever associated with this dynamic innovator in nursing education,” Malone said, according to the release. The Office of Sustainability teamed up with student organizations Monday to host an Earth Day fair in Kogan Plaza. Baseball splits its doubleheader with Davidson Saturday but dropped Sunday’s game to lose the series.